Metalworking hand tools for sawing metal and hard plastics etc. Uses disposable blades with various teeth patterns and the standard length of 12 inches. First made by Stanley. A small saw with a simple one piece bent metal frame for metal and plastics cutting. It uses cheap disposable 6 inch blades. A handle and a support bar that uses standard length hacksaw blades. The front end of the blade is not supported and so it is useful for sliding into spaces that a standard hacksaw will not fit into. The hacksaw above is a standard 12" size. Some saw frames are adjustable for a number of blade lengths, with 10" being fairly common. In general the teeth are set facing forwards to cut on the forward stroke, however sometimes on thin material when using fine blades it it advisable to reverse the blade to cut on the pull stroke, similar to a coping saw, to prevent buckling the blade. Standard hacksaw blades have from 14 to 32 teeth per inch. The thinner the metal to be cut the fewer the teeth. There is a blade pattern that has a wavy edge. These have typically very fine teeth and they are used for cutting thin sheet materials. Normal very small teeth would not be able to have much set on them, so the wavy design gives the blade more clearance in the cut to stop binding. The old 19Th century hacksaw type on the right has a lot sturdier blade than the modern mass produced ones. It would probably have been used for cutting heavier material that today, would be cut with power tools. In fact the blade size and tooth pattern is very similar to modern power hacksaw blades. The power hacksaw itself is almost gone from the modern metalworking shop, being replaced by the faster band saws and circular cold saws..
Standard hacksaw frames using today's modern thin HSS (high speed steel) blades require a lot of tension to enable the saw to cut straight and on the push stroke without buckling. So choose a saw with a sturdy frame and a good method of tensioning the blade. The Stanley Junior Hacksaw was an immediate success when it first came on the market. It's small size and cheap price made it a must have tool in many portable tool kits. 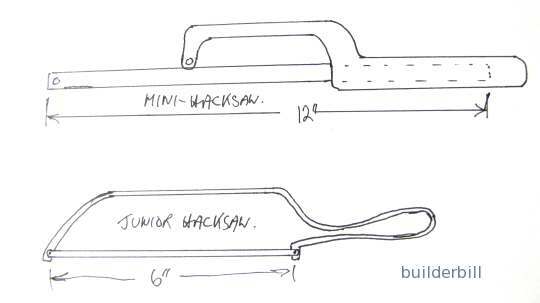 The mini hacksaw frame uses the basic idea of a pad saw, a single handle supporting a thin blade. Because of the lack of rigidity of the blades the handle has an extension to support the blade. Fit the blade pointing toward the handle and cut on the pull stroke. This is a very slow and often tedious saw to use, but may times it is the only tool that will do the job.